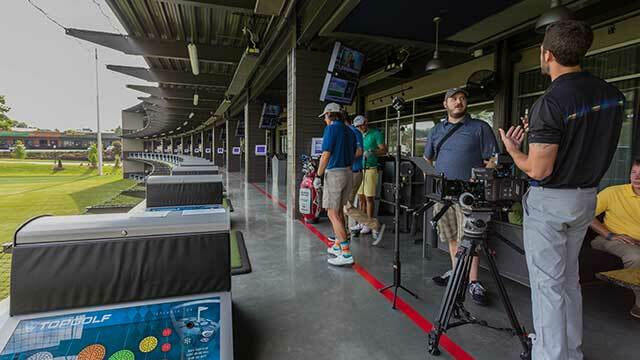 360 Labs had the opportunity to work with Callaway Golf and the Bryan Bros at a brand new Top Golf location in in the Summer of 2015. Co-founders Matt Rowell and Brad Gill traveled to Atlanta, GA to produce an 8 episode 360 web series. The Bryan Bros gave us their best trick shots and instructions for a better game. The goal was for Callaway to be able to deliver a unique experience ready for Google Cardboard and YouTube 360. With only one day to get 8 short 360 videos in the can, this project was very fast paced in production time and turnaround. Luckily, Callaway’s in-house media production team worked closely with us to plan every detail. They had scripted each shot, and we provided feedback on which ideas would work best in 360. Each scene involved several takes in order to make sure the moment was captured perfectly. Afterall, trick shots are not necessarily easy to do when you are chipping over an expensive 360 camera. Dialog was captured with wireless lavalier microphones so that the Bryan Bros could move freely about. Making use of our daylight seemed to work out perfectly before the raging thunderstorms of the South rolled in. Telling a story in 360 video can be difficult unless you use the right tools. When the Bryan Bros explained the nitty gritty details about grip and alignment, we needed a way to zoom in for a better view. We were able to use Mettle’s Skybox Studio to position picture in picture video to show closeup details within the 360 video sphere. This helped us zoom in to details needed without removing the user from the immersive experience. We also adapted Callaway’s own branding assets to the 360 format, including lower thirds and an instructional splash screen. In the end, Callaway had a 7 part web series with 1 bonus trick shot to share on social video channels. As of the time of writing, their 360 videos have racked up almost 200,000 views over a few months, and were also featured in YouTube’s own #360video channel. Give these a spin in your Google Cardboard or Viewmaster and let us know what you think!